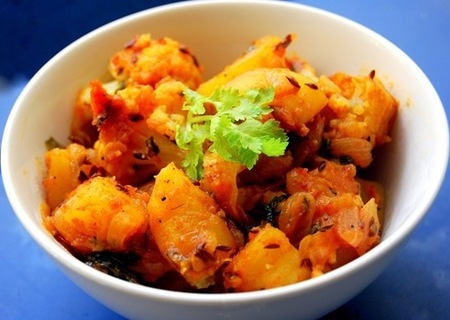 This Aloo Gobi recipe is amazingly straight forward to make and the results are amazing. It is one of my favorite Indian dishes and I ate it all the time when I was in India. I hope you enjoy it too! If you do or you think that it may need improving at all then please just let me know. Of course if you have a recipe that you would like to share with our readers then please click here. Boil water in a large saucepan and throw in the potatoes. They need to be par-boiled so boil for about 9 minutes. Drain and set aside. Fry the cumin seeds, garlic and onion in a frying pan with the oil for about a minute, or untill they crack open. Add the chopped chilli and fry for another minute. Break up the cauliflower into florets and put into the pan. Keep stiring. Add the tomato puree, worcester sauce and a little salt. Add the potatoes and the other spices and cook for about 8 - 10 minutes. keep stiring. Add a splash water if you feel it is a little dry. Garnish with the fresh coriander and tomato and serve with pickle and chappatis.